He gazes at me, steel blue eyes searching. He gazes. And gazes. Sometimes so intently, for so long, that I have to work to hold my own gaze steady, to meet his eyes with mine. This is part of the (happy) work of having a newborn. Watching them. Watching them change in front of your eyes. Cheeks rounding, lashes lengthening, hair thickening, thighs plumping, fingers uncurling. Wondering what they will become. Wondering who this person might be, whose life I hold in my hands. My grandma used to call this stage “the baby’s face unfolding,” waking to the world. My mom tells me this each time she visits to help and hold our newborns. It is the same story all parents watch, over and over again. A first chapter opening in a brand-new book. But you have to look to see it. Behold. He’s an old soul, my friend declares, handing the baby back to me. You can always tell by their eyes. Later I think about her words and wonder if we’ve gotten them backwards. 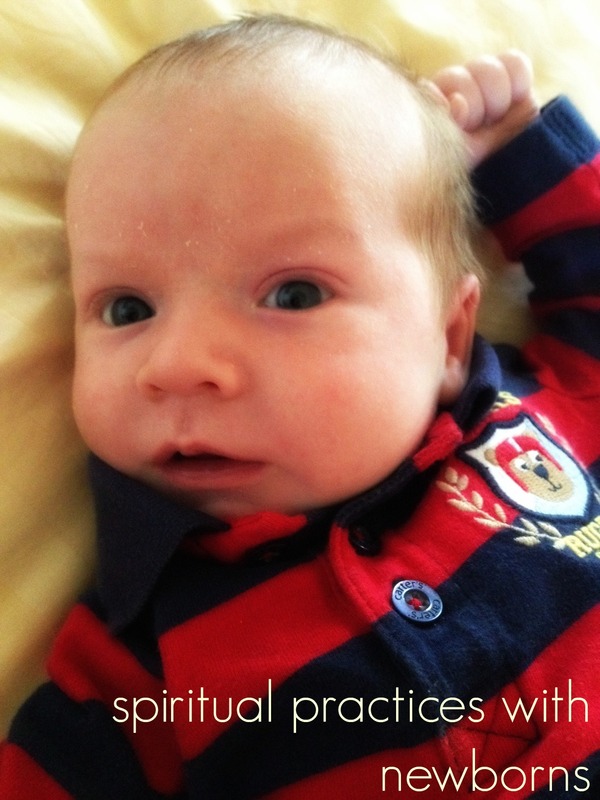 Even setting aside reincarnation, as we Christians do, the saying suggests that contemplative, quiet babies are wise beyond their years. That they hold some distant, ancient knowing behind their eyes. But babies are able to hold our gaze so intently precisely because they are brand-new. They have no filter yet to smudge up their view of the world, no hurt, no grudge, no knowledge of evil. Their innocence is what permits them to disarm us by their unrelenting gaze. They will not avert their eyes out of shame or drop their glance from embarrassment, not yet. They have not learned that lesson. What we see blinking back at us in their eyes is not the wisdom of the aged – as clear as their vision of the world can be. Instead, babies bring utter openness. Unclouded vision. Eyes not yet dimmed by the cruelty or sorrow they will inevitably see. Not worried or weathered or wearied by years. He is a young soul, in fact. Behold. What does it mean to behold? In Scripture it’s the greeting of the angels. Behold, for I bring you tidings of great joy. In church it’s the reminder that recaptures our attention every time we gather round the table. Behold the Lamb of God. Behold him who takes away the sins of the world. In literature it’s an air of importance. Lo and behold… There’s a weight to beholding, beyond watching or seeing. You are witnessing an impressive sight. Even the parsing of the word – to be and to hold – signals a notable duality: you must take a certain stance and accept what it offers. And when you contemplate in the way that beholding invites, something will happen. You will appreciate or perceive or understand or discern differently than you did before. This summer I’m beholding my own life, too. For the first time in a long time, I’m looking around at everything I have and finding it so good. Yes, there is the exhaustion of the newborn days. And yet I have felt profoundly happy ever since this baby arrived. For a while I joked about it to friends as “really good hormones.” But now I start to see how much deeper this joy and gratitude runs. I found new motherhood hard, really hard. I remember in the early days reading about the shift that happens when your first child turns five. All of a sudden you glimpse the light at the end of the tunnel – that your life will not always revolve around dirty diapers and 2 am wakings. That your child is growing up, and quickly. Becoming a person before your eyes, a walking, talking, someday-even-rational human being with all the fullness and wonder of what it means to be human. And I feel that now, with Sam heading off to kindergarten in the fall. Perhaps for the first time, I feel myself settling into motherhood with deep-seated joy, less tinged with the anxiety that accompanied his birth. I look around me at our growing family, this beautiful bunch of boys, a husband I adore, work that I love, writing that sets my heart on fire. And I feel so blessed, so deeply wrapped in the presence of God. It has been a hard summer already, physically and emotionally, and yet I have not lost sight of the deeper joy here, the stream of goodness running through it all, clear and fast and strong. I can behold my life in bright sunlight, eyes open and willing to hold the gaze. And I am able to be what I hold. The babe is at that lovely stage where smiles start, now only small bursts of wide-cheeked delight, fleeting rewards for the monkey faces I ape at him, over and over, hoping to catch a grin. I have to watch him for a long time to see them. He is teaching me the practice of beholding: the discipline of deciding to stop and see what is right before my eyes. Perhaps that’s the lesson in beholding: that you have to be here and hold on if you want to witness the joy, to catch the goodness that rushes behind, beyond, underneath the surface. These things are trustworthy and true, these moments of joy we know to be of God. Watch the beauty unfolding before you. Watch your own life blossoming. Watch it bring you joy. Write these words down. Behold. For a new twist: today look your child or loved one in the eyes. Behold them. How does it feel to hold their gaze without words? Where do you see the good – the God – within the life you love?